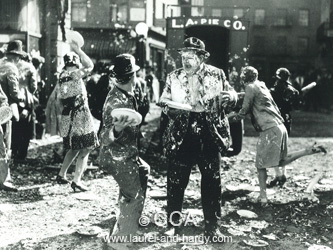 In 1968 as the company reorganized and was emerging from bankruptcy, Hal Roach went to Wall Street in search of production funding via a public offering of common shares. Buried in the prospectus was a declaration that $50,000 of the proceeds would be dedicated to transferring certain negatives from nitrate to safety stock. At last someone recognized the problem. Instead, to save money, all the nitrate (having been temporarily relocated to the noted John E. Allen’s lab in northern New Jersey) was deposited at the Library of Congress. Two remote storage locations were used not so far from Washington, D.C.: the Wright-Patterson Air Force Base in Dayton, Ohio, and the Suitland depot in Maryland. Al Kilgore and Chuck McCann, founding members of the Sons of the Desert organization, were instrumental in making this rescue effort possible. In two later instances, TV licensees did invest in preparing their own printing negatives, with reluctant assistance from the Library of Congress (since commercial use only risked and did not support conservation of the physical elements). Neither outcome was satisfactory. King World Productions – despite having OPRAH, JEOPARDY, and WHEEL OF FORTUNE money – successfully circulated only dupey-looking, sloppily and heavily edited versions of the Our Gang comedies. At least Saul Turell’s Janus Films made a conscientious attempt to reconstitute new, faithful16mm Laurel & Hardy negatives for their own use in television syndication. The Janus effort took two years. But the results were mixed. In WAY OUT WEST (1937), e.g., sound levels varied, there were jump cuts, the stream-crossing finale was incomplete, and the original end title was replaced. From 1957 through 1970 filmmaker Robert Youngson mined the Roach library of silent comedies to produce a succession of wonderful compilation films, including THE GOLDEN AGE OF COMEDY (1957) and WHEN COMEDY WAS KING (1960). By then HATS OFF was already lost, and BATTLE OF THE CENTURY was decomposing. Youngson wasn’t intending to do so, nor was it his responsibility, but by converting, selectively, the deteriorating nitrate he wanted to use onto safety film stock, he preserved it. Youngson only copied, however, what he wished to excerpt for the movie he was making. So he only saved the footage from BATTLE OF THE CENTURY that he included in his anthology feature. He had the opportunity to run a complete fine grain and preserve the entire film, but then so did his licensor, Hal Roach Studios, which did nothing. Not long after Youngson pulled what he needed from reel two, which was an abridgement of the pie fight footage, the balance of the reel decomposed while in the custody of Bonded Storage in New York, was counted out, and then junked. So-called substandard 8mm and 16mm safety film offered an alternative to the devastations of 35mm nitrate stock. Youngson’s success heralded a renaissance of interest in silent short subjects, and Roach licensed many 8mm and 16mm non-theatrical distributors to serve the domestic market for college film societies, churches, libraries, civic groups, and home entertainment. Such small business operations reproducing silent comedies in the substandard film gauges included Official Films, Erko of Hollywood, Library Films, Film Classic Exchange, Entertainment Films, Select Film Library, Exclusive Movie Studios, many others. Not to mention the scores of film piracy operations like the much reviled Home Movie Wonderland of Hollywood offering abominable dirty, dupey, scratchy mutilations of prints developed in a residential bathtub. And yet I have a 16mm print they issued on a Roach-Pathe subject starring Charley Chase’s brother; I could not ever locate another copy on any film gauge anywhere in the world. Insofar as they survived, during the 1930s and 1940s scores of Hal Roach comedies previously released during the Pathe period were licensed for non-theatrical library use and home entertainment on 16mm, principally through Eastman Kodak’s Kodascope Library. These now highly-prized, old, used exhibition prints – often flawlessly printed on beautiful amber-toned stock from primary material – are almost always the only source from which preservation can be performed today. In most cases, all other 35mm elements have been lost. 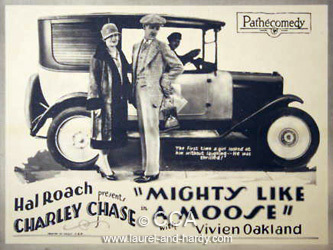 The remarkable Charley Chase comedy, MIGHTY LIKE A MOOSE, released by Pathe and not by M-G-M, is such an example. The film has now been enshrined in the National Film Registry of the United States Library of Congress, and yet it exists only on 16mm. (Even if it existed on 35mm, the corresponding legislation is absent any funding so the congressional citation is purely honorary.) Without but a few remaining Kodascope prints to master from, this delightful comedy would not exist at all. And unfortunately as has been discovered in the last two decades, even these 16mm safety prints are also at risk. So-called “vinegar syndrome” is a fate equal in every way (except for fire risk) to nitrate decomposition. During the 1970s when I worked for the studio’s principal non-theatrical licensee, Blackhawk Films, Inc., of Davenport, Iowa, I learned that while the company mastered from Roach’s prime 35mm preprint material, it was only borrowed for a single pass in order to create either a reduction dupe negative or fine grain (35mm masters were, however, created for some of the most popular titles as well as selected Our Gang and Charley Chase subjects). But that meant we were working primarily in 16mm. 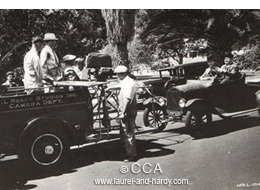 Optimum preservation cannot be obtained blowing 16mm back up to 35mm, although, as David Shepard points out, preservationist Jere Guldin’s restoration and blowup of Chase’s MOVIE NIGHT (1929) for UCLA has been well-received in recent theatrical screenings. Also, because of contractual trademark restrictions, founder Kent D. Eastin was steadfast on the point of replacing all the artistic original title card designs, and replacing them with standardized Blackhawk Films titles. At least Blackhawk otherwise made a good faith attempt to present the films “substantially as first issued to movie theatres,” as the windy introductions for silent subjects used to read on screen. Plus Blackhawk invested in its own printing elements, and the original source material did not suffer. HATS OFF and BATTLE OF THE CENTURY were handled by M-G-M, not by Pathe. Before Blackhawk Films was really active in home entertainment and library sales in the 1960s (although its first agreement with Roach was in 1952), the M-G-M silents were never licensed in substandard film gauges for non-theatrical exhibition, and therefore were never printed for the 16mm market. No complete, vintage 16mm print of either title will ever surface because they were never printed in 16mm. At least such two-reelers as MIGHTY LIKE A MOOSE endured and remain in some form. When Hal Roach Studios emerged from bankruptcy, the equity was split in 1971 as between the Eastern and Western Hemispheres. In the latter, rights passed from Hal E. Roach, Sr., Herb Gelbspan, and the trustee in bankruptcy, to, principally (to simplify a convoluted situation), Earl Glick’s Portcomm Communications, Robert Halmi’s RHI, Hallmark Entertainment, and back to RHI. Overseas, the copyright proprietor has always been CCA. 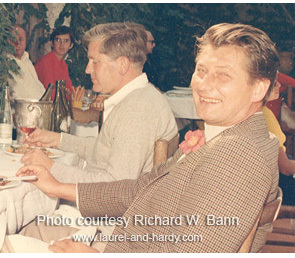 Hans Andresen was the co-founder, with the better-known majority owner, Dr. Leo Kirch, of what evolved into KirchMedia GmbH & Co., as well as many related privately-held production, distribution, and rights trading European companies, primarily in Germany. Companies including CCA which Messrs. Kirch and Andresen controlled are in fact the corporate successor-in-interest to Hal Roach Studios everywhere in the world except North and South America, and they have been, continuously, although quietly, for the last forty years. 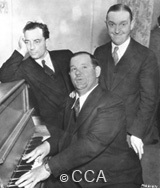 The Buster Keaton revival may never have happened were it not for the role Hans Andresen played in consolidating rights to Keaton’s silent films from three overlapping claimants, then financing the preservation performed by Raymond Rohauer, and touring with them both in Europe, before finally returning to America for rediscovery. Keaton, incidentally, is yet another example of an iconic artist who indifferently abandoned the nitrate of his own master works, believing them to be worthless! Even near the end of his life during the 1960s, Keaton could not fathom why audiences would care to watch films he made which were four decades old. Today CCA is controlled by Klaus Hallig, long-time close associate of Kirch and Andresen. Thanks to these three, during the 1980s and through 2002, I was able to supervise the expenditure of millions of dollars rescuing, restoring, revitalizing, converting and preserving the nitrate film elements in the Hal Roach library. These are the same nitrate elements consolidated from the Culver City vaults and East Coast storage depots which were first deposited at the Library of Congress in 1969 a couple years after Hal Roach Studios emerged from bankruptcy. We are the only company or institution or archive anywhere in the world which has ever undertaken to restore and preserve and distribute the surviving film materials that constitute the entire post-bankruptcy library of Hal Roach Studios. To do this work and overcome the bureaucratic intransigence involved, our side, meaning CCA, together with RHI whose cooperation was required, withdrew the thousands of reels of nitrate from the LOC and moved it all back to Los Angeles. The actual conversions work at an editing bench, with a light box, between rewinds, comparing repairing and selecting elements, then finally at a contact printer, was performed locally at an archival laboratory named Film Technology Company, by a knowledgeable and dedicated colleague from our days together at Blackhawk Films, Bill Lindholm. Nitrate conversions of painstakingly researched and sometimes diverse source material were made using step-contact, curve-gate, pin-registered printing with diffusion filters as opposed to continuous wet-gate printing. This method, utilizing a specially built printer insured an extremely sharp, rock-steady image, despite the amount of shrinkage and/or damage any particular element had sustained over its (at least) half-century in existence. That means we decided against wet-gate printing, which hides more visible scratches and wear than does diffusion, but then the image would not have been as steady or as sharp. Nor was any kind of digital cleanup performed, which is an option (albeit an expensive one) under consideration for any new institutional preservation such as is being contemplated by UCLA. All costs have increased dramatically since we did our work, and a meticulous digital cleanup could double the already much higher total expenditure. The ambitious work we did with respect to each film title generated a 35mm preservation fine grain and dupe negative derived from the best surviving and lowest generation nitrate film sources we could locate from around the world. These two elements were then shipped to Munich for underground state-of-the-art FICA-Method vacuum pack cold storage. For each film, we offered to RHI, as an accommodation, at cost, one 35mm fine grain master, which the company often, but did not always, elect to acquire. To the extent RHI furnished its licensees, including Cabin Fever and Vivendi Entertainment, with copies of the fine grains we made (and have shared with our licensees such as Virgin Vision, Kinowelt, and Universal), they look beautiful. As one example, this past January, Turner Classic Movies telecast a Hal Roach festival. The Our Gangs were derived from new fine grains we provided to RHI which are identical to the preservation material now stored in Munich. On TCM, they looked beautiful. The Laurel & Hardys were not derived from new fine grains identical to the preservation material now stored in Munich. On TCM, the Laurel & Hardys did not look so beautiful. In 2008 the ironically named Genius Products issued an Our Gang DVD boxed set. These films were serviced from our work as well, except for the approximately fourteen titles where RHI either lost or failed to deliver the fine grains we made for them, and so they resorted to drawing upon 16mm Blackhawk projection prints instead – a sorry situation which is now, happily, being remedied by RHI’s new licensee, Vivendi Entertainment. Finally a third example, from the Hallmark era – yes, that Hallmark, of Hallmark Cards. As an expediency, in 2003, instead of using the fine grain we provided, they pulled an “old” colorized video master of SONS OF THE DESERT (complete with black-screen commercial breaks that faded in and out), and then de-colorized it to facilitate a DVD release. Then Hallmark issued a second DVD, which included CHICKENS COME HOME (1931), but not the main title card that says so! Did they think no one would notice that the film’s title was missing? Did Hallmark notice themselves? They did manage to leave unscathed, however, the Film Classics cast listing card that credits Mae Busch – as “Bush.” Wrong of course, but very close!